So...this has been happening these past few days. Well, just the knitting part. Not so much the extravagant donut eating. Oh, but how I wish I was eating luxurious donuts every day! But the knitting, yes!! I've been knitting!!! I'm not getting too overly excited about it though, not getting my hopes up too much - just in case those hopes get dashed and I'm back to the miserable state of not being able to knit at all. Instead I'm relishing in the fact that I can knit at all! 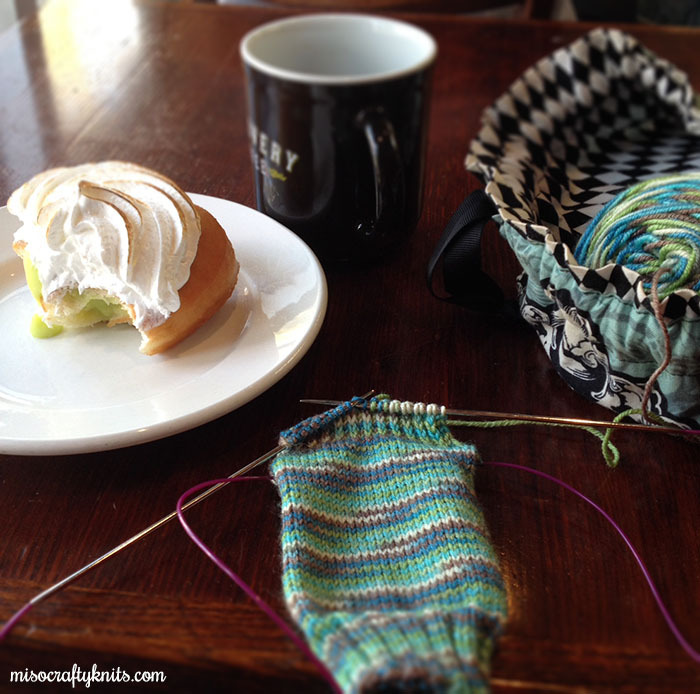 I still have to take it easy and not dive back into my usual ways and lengthy knit sessions. I'm only allowing myself to knit a few rows or rounds per day for the next couple of days and building up to a few rows/rounds per sit down. And definitely stretching a lot before, after, and between!! Since taking this photo I've learned that my hands really can't handle socks or tiny needle projects just yet. I experience mild tightness and rather than trying to grin and bare it, I've decided to just concentrate on knitting with bigger needles and thicker weight yarns...like my PinkSands cardigan project, which is just 2 sleeves away from being done. It's taking every fibre of my being (no pun intended!) to not just power through the sleeves and get this cardigan done already. I have to keep reminding myself that if I want to keep knitting I have to take it slow or I'll end up spending the next 3 months not being able to knit again. I seriously don't know if I can handle going that much longer without knitting! In the meantime I've been ecstatic that I'm not feeling constant pain in my wrists any more and am SO incredibly thankful that the regular use of, and the nighttime wearing of braces has thoroughly helped in my recovery. Since wearing braces at night I've been finding that not only can I get some actual sleep but my sleep is restful and I'm not in that horrible state of being half awake, half asleep because I'm so aware of the pain in my wrists. It's totally cliché but it's amazing what a good night's sleep can do! And wow, I also cannot express just how good it feels to be able to knit again!! I just have to remember to keep stretching...keep taking little breaks...move around, change positions. Speaking of which, maybe I should take this moment to do some stretches. And think about what I should knit next after I finish my PinkSands cardigan, now that my knitting game plan has to change to using heavier weight yarns for the next little while. Tell me, what have you been working on lately? So good that your hands are feeling better! And it must feel so good to get back to some knitting! Hooray, so glad to hear that your wrists are on the mend! Sounds like you're practicing awesome self-care - donut included - and I bet it feels really good to have that hard work and patience pay off. Happy knitting indeed!